adjective Ambivalent: confused or ambivalent because of competing desires, possibilities, or impulses (informal) I haven’t known him when he wasn’t conflicted about his relationship with his family. 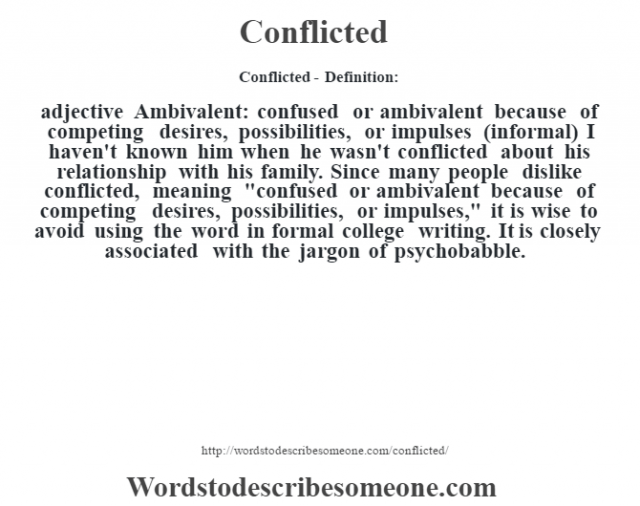 Since many people dislike conflicted, meaning “confused or ambivalent because of competing desires, possibilities, or impulses,” it is wise to avoid using the word in formal college writing. It is closely associated with the jargon of psychobabble.